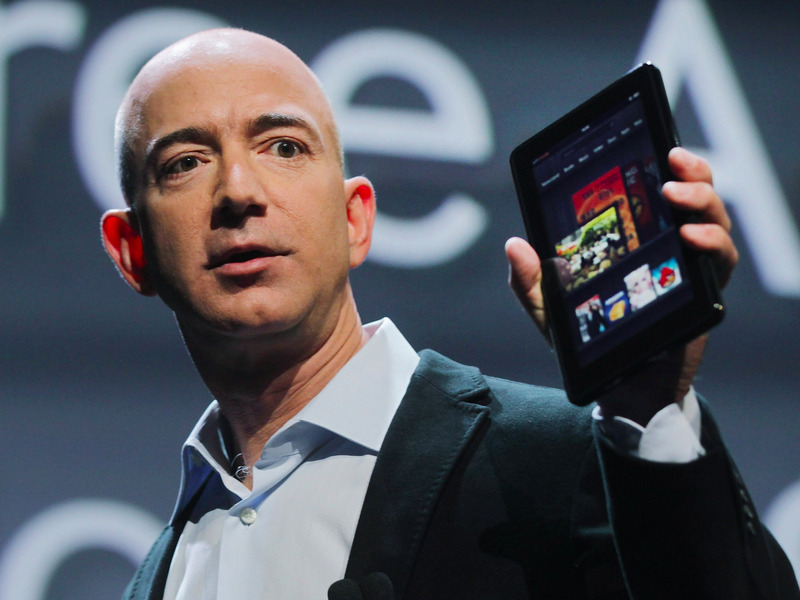 Amazon founder Jeff Bezos holds a Kindle Fire tablet. Amazon has quietly dropped support for disk encryption on its Fire tablets, saying the feature that secures devices by scrambling data was not popular with customers. Privacy advocates and some users criticized the move, which came to light on Thursday even as Apple was waging an unprecedented legal battle over U.S. government demands that the iPhone maker help unlock an encrypted phone used by San Bernardino shooter Rizwan Farook. On-device encryption scrambles data on a device so that it can be accessed only if the user enters the correct password. This helps secure users' data against hackers, or if the device is lost or stolen. The Guardian reports that the change isn't mentioned in public materials Amazon has put out about the update. Cryptologist Bruce Schneier said Amazon's move to remove the feature was "stupid" and called on the company to restore it. "Hopefully the market will tell them to do otherwise," he said. Amazon is publicly supporting Apple in the iPhone case. On Thursday, it — along with Facebook, Google, Microsoft, and other tech companies — filed an amicus brief asking a federal judge to overturn the court order requiring Apple to create software tools to unlock Farook's phone. The brief said the companies "are also fully united in their view that the government's order to Apple exceeds the bounds of existing law and, when applied more broadly, will harm Americans' security in the long run." Apple's legal battle with the FBI has thrust encryption and cybersecurity onto the US national agenda during an election year, divided public opinion, and pitted the might of the US Justice Department against one of the world's most powerful companies. "Given that the information stored on a tablet can be just as sensitive as that stored on a phone or on a computer, Amazon should instead be pushing to make device encryption the default — not removing it," Gillula said.